"National anthem of the Russian Federation"
Alexander Vasilyevich Alexandrov (Russian: Алекса́ндр Васи́льевич Алекса́ндров; 13 April [O.S. 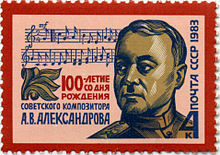 1 April] 1883 – 8 July 1946) was a Russian Soviet composer, the founder of the Alexandrov Ensemble, who wrote the music for the State Anthem of the Soviet Union, which, in 2000, became the national anthem of Russia (with new lyrics). During his career, he also worked as a professor of the Moscow State Conservatory, and became a Doctor of Arts. His work was recognized by the awards of the title of People's Artist of the USSR and the Stalin Prize. Alexander Vasilyevich Alexandrov, known as Sasha, was born on 13 April 1883 in Plakhino, a village in Ryazan Governorate south-east of Moscow. As a boy his singing was so impressive that he travelled to Saint Petersburg to become a chorister at Kazan Cathedral. A pupil of Medtner, he studied composition at Saint Petersburg and in Moscow, where he eventually became professor of music in 1918 and choirmaster at Christ the Saviour from 1918 to 1922. Alexandrov founded the Alexandrov Ensemble, and spent many years as its director, in which role he first gained favor with Joseph Stalin, the country's ruler during the last two decades of Alexandrov's life. His choir participated successfully in the Universal Exposition of 1937 in Paris, and in 1942, Stalin commissioned him and lyrist Sergey Mikhalkov to create a new Soviet national anthem, which was officially adopted on 1 January 1944. It was very popular, and was used by the Soviet Union until its collapse in 1991. It later became the National Anthem of Russia in December 2000, with Mikhalkov writing the new lyrics. He also composed the famous song The Sacred War, and the official march of the Soviet and now Russian Armed Forces, the Song of the Soviet Army. His works include a number of settings of various Russian folk songs (e.g., "Utushka lugovaya"). He died on 8 July 1946, while on tour in Berlin; some records say he was returning from Germany. Wikimedia Commons has media related to Alexander Vasilyevich Alexandrov. ^ "Борис Александрович Александров (1905-1994)" [Boris Aleksandrovich Aleksandrov (1905-1994)]. Archived from the original on 2007-09-17. Retrieved 22 January 2018. ^ А. Александров (in Russian). ^ The exact place of his death is still in dispute and apparently controversial.